Lenawee County was a hotbed for antislavery activities in the 1830s that translated into strong Union support in April 1861. Adrian, Tecumseh and Hudson sent hundreds of soldiers to fight and die in the Civil War. The Emancipation Proclamation propelled nearly fifty of the county's African American residents to take up arms to preserve the nation and end slavery once and for all. Captain Samuel DeGolyer, creator of the Lenawee Guard, escaped Confederate prison in Richmond. On the homefront, residents like Laura and Charles Haviland sheltered fugitive slaves and even donated land to help families start anew. 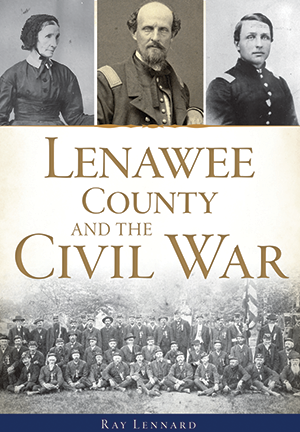 Join author Ray Lennard as he explores the events of the war that changed Lenawee County and the nation forever. Lenawee County native Ray Lennard is the president of the Lenawee County Civil War Round Table, curator at the William G. Thompson House Museum and vice-president of the Lenawee County Historical Society. Ray is also a living historian with the 12th South Carolina/4th Michigan reenacting group and is an adjunct instructor teaching public history at Adrian College. He has published several works for the museums and, before working there, Ray was reference librarian at the Jackson District Library.